Jay developed a style in the studio that keeps him in demand. His ability to get a big sound from real instruments (like a full drum set or a nice acoustic guitar) constantly keeps his projects in the news. He has worked with Grammy Award winners David Holt and Fernando Rivas and has done voice-over projects with Golden Globe winners Tom Berenger and Donald Sutherland. His reputation as a guitarist won him a spot on the Major League 3 soundtrack doing a version of Santana’s “Oye Como Va” on classical guitar. The music director liked working with Jay so much he got him a spot in the movie’s bar scene playing in the background. His work with the Frank Carlier Band receives glowing reviews all over the world. The western swing group Swing Soup was nominated for several awards and had airplay on numerous radio stations. 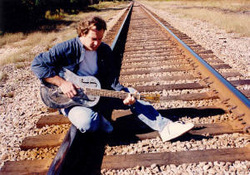 His guitar and production work on the humbles “Firewall” was voted CD of the year by Charleston’s Free Time magazine. Jay’s love for playing live never diminished and he manages to perform at least three times a week. His creative juices flow now more than ever. The recently released CD LAST MAN STANDING is proof positive that Jay is a man on a mission. This acoustic project (only the Hammond B3 organ was plugged in) has eleven songs that rock. Jay not only recorded and produced it, but played the resonator, classical guitar, acoustic guitar, fretless bass, percussion and vocals. Rodney Stone (bassist from the Jay Miley Band) had upright bass duty and provided back ground vocals. Frank Cothran displayed his talents on drums and percussion, and Nashville Symphony cellist Matt Walker lent his skills on strings. Longtime friend Frank Carlier showed his mandolin chops on the ballad “My Heart Don’t Feel Like Runnin’ No More.” Others include Bill Nance on piano and organ, and the sweet sound of vocalist Carol O’ Quinn. A gospel choir helped on the tune “What A Time” showing the influences of the rural AME churches Jay went to as a kid.